Daggers were indispensable tools and had many uses, from being used as an eating utensil to personal defense when not in use on the battlefield. 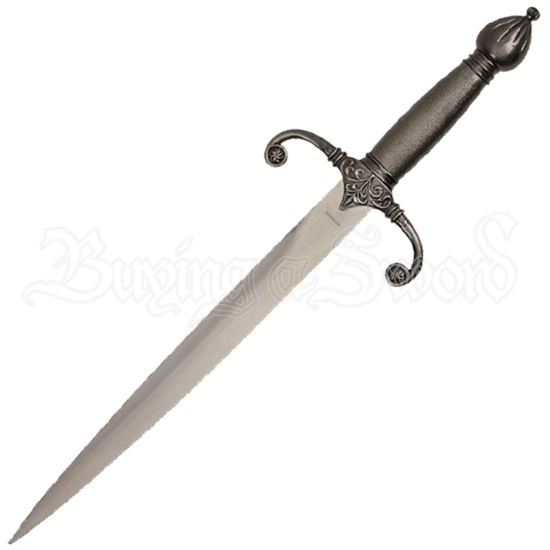 This Curved Guard Medieval Dagger makes a great display item or medieval costume weapon. The long blade is made of stainless steel. Intricate design work decorates the curled guard and a textured handle adds to the visually appealing aesthetic. A stylized scent stopper pommel completes the look of this dagger. Included with this beautiful weapon is a scabbard that features silver fittings with designs matching the guard of the dagger. This collectible dagger is sure to become a source of pride for anyone who enjoys medieval history.